Syria experienced healthy economic growth rates between 2000 and 2010. However, the country continues to suffer from deficits in social-political dimensions of human development, as marginalized and disempowered groups, including rural communities, face barriers to participation, and accessing opportunities. This study seeks to identify the determinants of empowerment and its association with money-metric poverty in 24 villages in rural Syria, using data collected in 2008 and 2009 through surveys designed with the participation of local communities. Indices were constructed using operational elements of empowerment that include access to information, inclusion and participation, and local organizational capacity. The results find that men are more empowered than women; young people are less empowered than adults; educational attainment is positively associated with level of empowerment, especially among women; and landowners are more empowered than others. We find a positive correlation between empowerment and poverty, measured in terms of spending per capita; however, the correlation losses its statistical significance when controlling for other socio-economic factors. Thus, on its own, increasing empowerment does not necessarily lead to improved economic livelihoods. 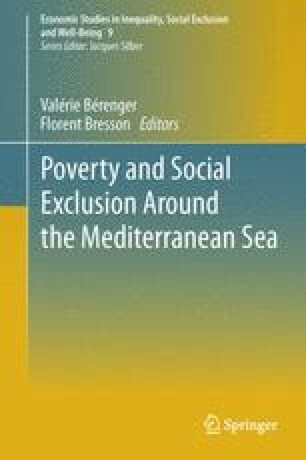 The findings suggest that policies and programs aimed at alleviating social-political and social-economic dimensions of deprivation may be complimentary and should be introduced in tandem. Hamyaran (Iran NGO Resource Center). (2006, April). Community empowerment for sustainable development in Iran. Paper presented at the Fifth MENA Development Forum, Beirut, Lebanon. Available in: www.info.worldbank.org/etools/mdfdb/docs/WP_TESEV1.pdf. Mehchy, Z. & Kabbani, N. (2007, December). Analysis of the characteristics of five villages near Ebla. Syria Trust for Development Report. Available at: www.syriatrust.org/research. Universes in Universe. (2011). Website accessed October 2011: http://universes-in-universe.org/eng/nafas/countries/middle_east/syr/(map).